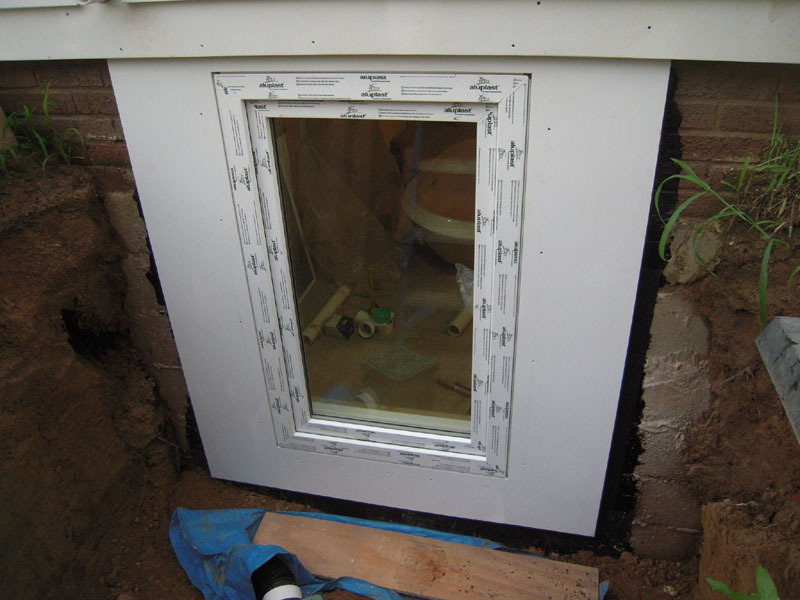 The two sub sills and the window buck are installed and plumbed and leveled. The bottom and top are screwed in with 4″ deck screws. The sides were foamed with large crack spray foam to fill the voids. After the foam is cured it is cut flush to the wall with a hand saw. 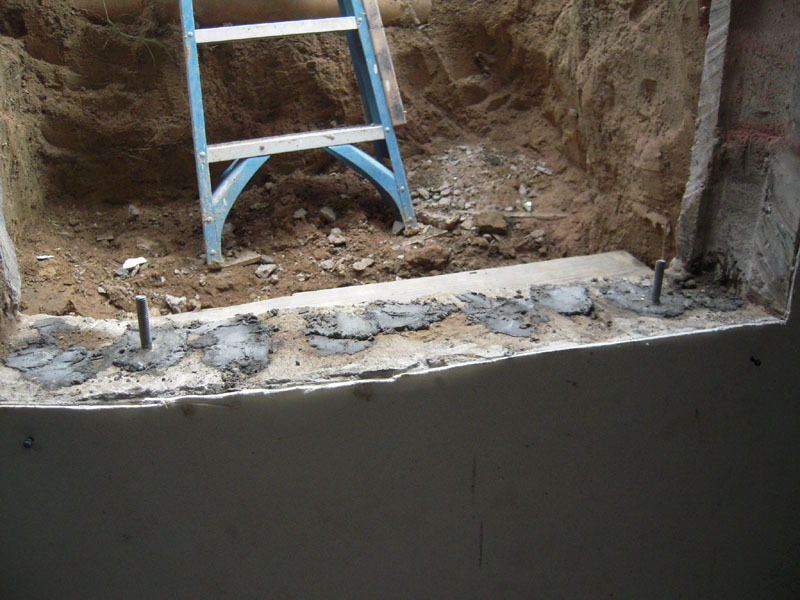 An asphalt based foundation waterproofing material was troweled over the cleaned foundation. 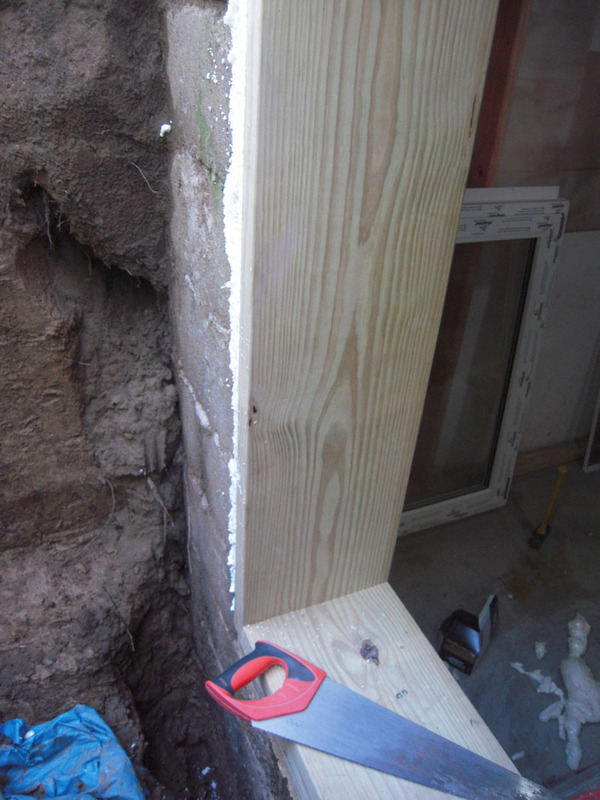 The white areas of block are visible because I had to grind down the surface to make the wall uniform and flat. The original mason wasn’t very good with a level apparently. 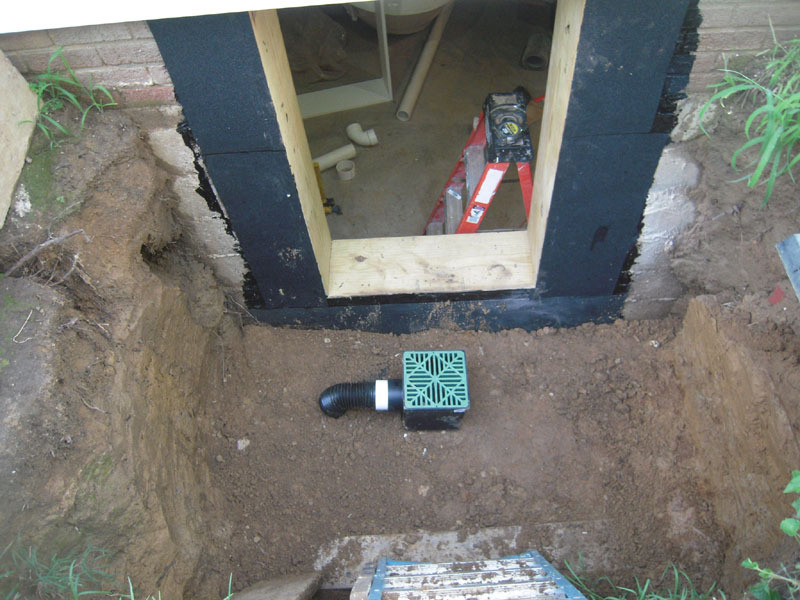 I decided to add a sump box for the well drain. 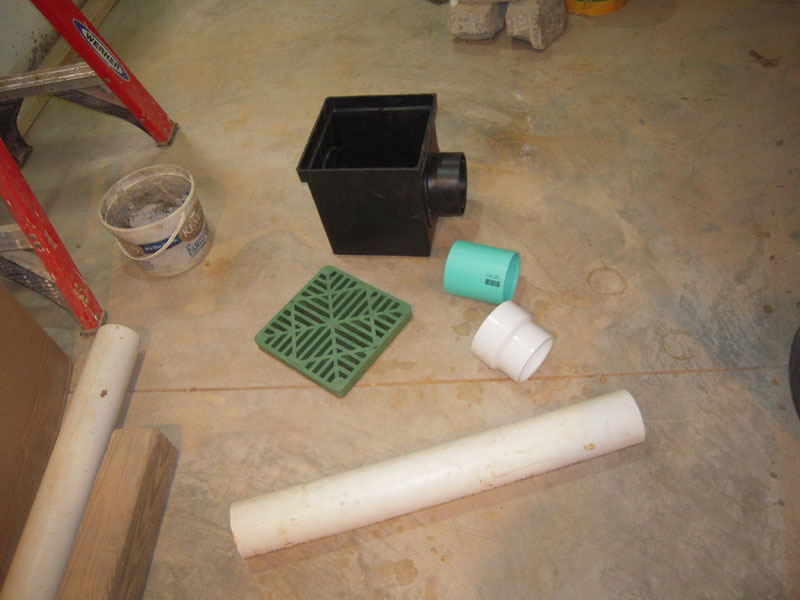 This is typically used in landscape projects – debris will settle in the bottom of the sump and keep from clogging the drain system. 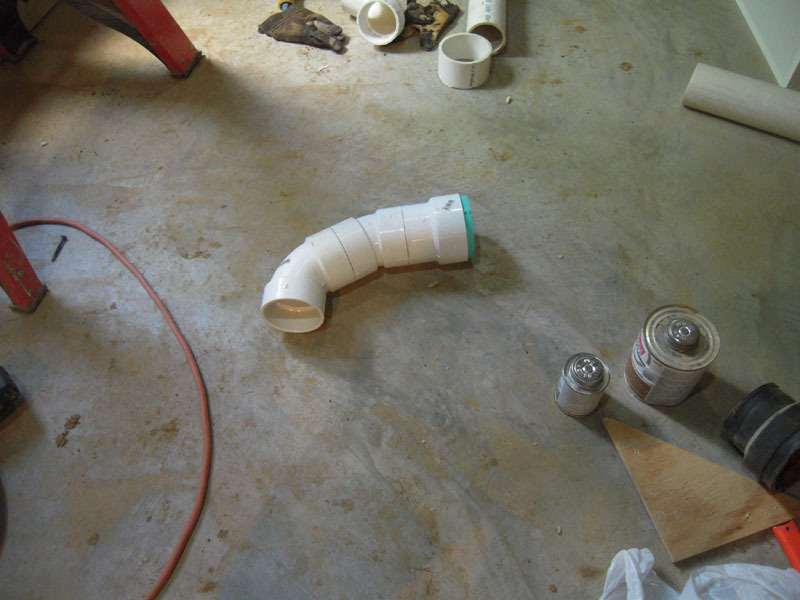 I used a 9″ square sump and my first thought was to use all PVC pipe to fit the drain. But after a little more thought I ditched that idea – but only after I glued several parts together. That was a waste of time and money – ouch! Instead I went with a solid flexible drain so that in the winter time I would have less issues if ground freezing was a problem. 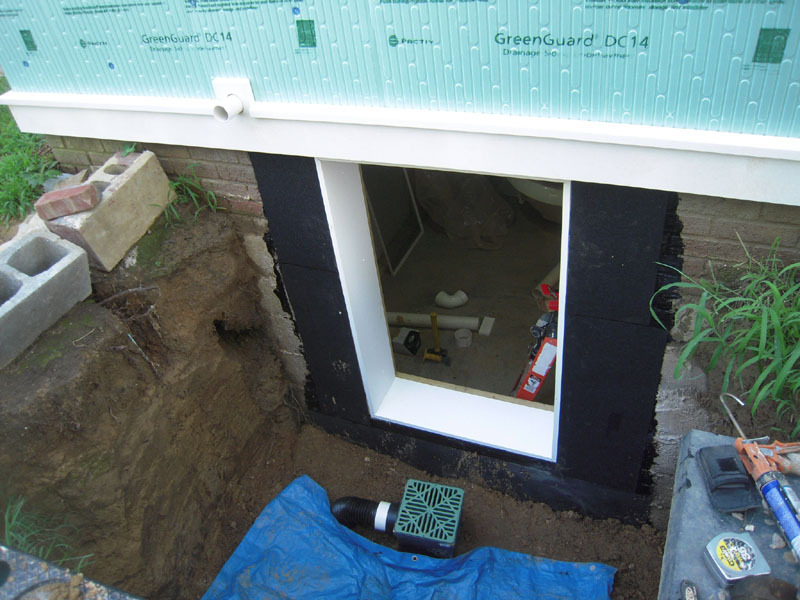 I also added a fiberglass membrane over the waterproofing on the foundation and the window buck for a little extra protection. 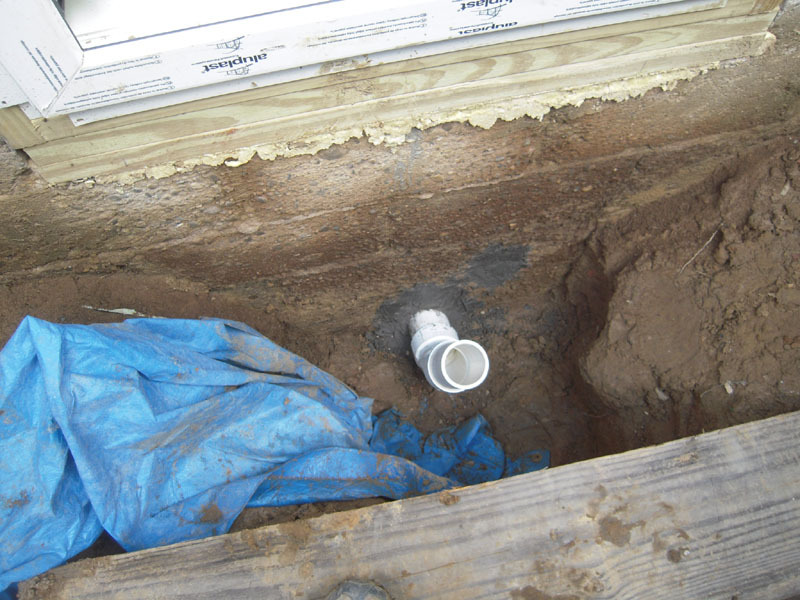 The drain was placed in the ground in the approximate location. The AZEK PVC frame was then installed flush to the buck with PL adhesive and cortex screws. 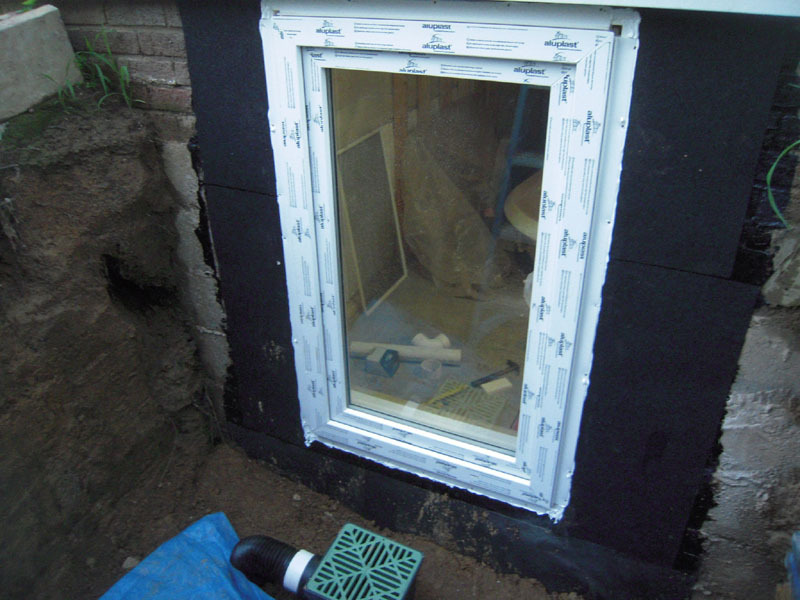 The window was then finally installed inside the PVC frame using elastomeric caulk and small head screws for treated lumber. The inside showing the spray foam around the window buck and the window sitting within the AZEK frame. 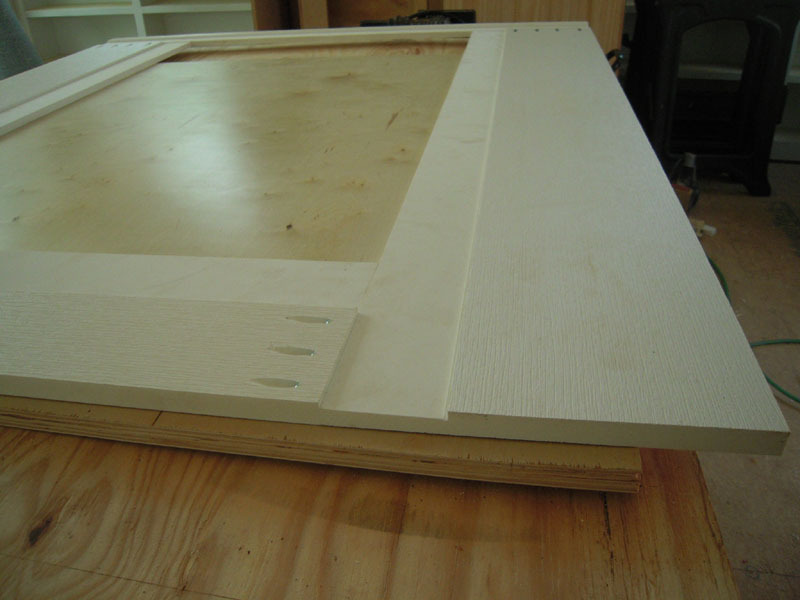 An exterior frame was fabricated from 1X12″ AZEK and assembled with PVC glue and Kreg screws. 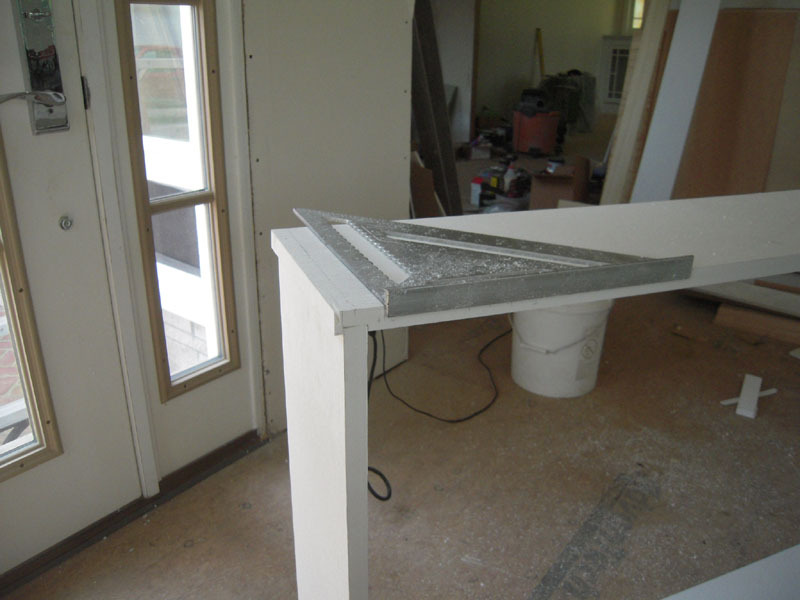 The back side has a wide rabbet to make it flush with the window and accommodate the window’s nailing fin thickness. Here’s the back side of the frame ready to be installed. 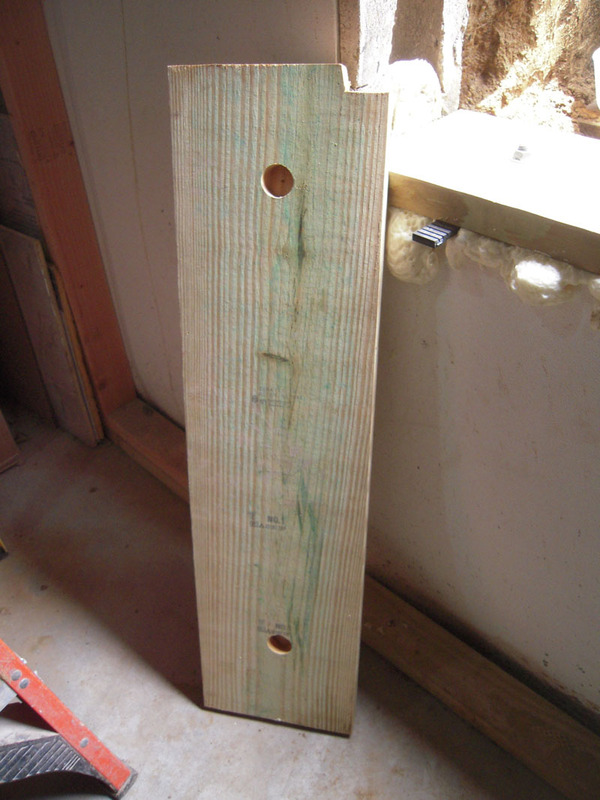 The screw holes were filled with caulk (over kill) The sides measure 11 1/4″ top 3 1/2″ bottom 8″. 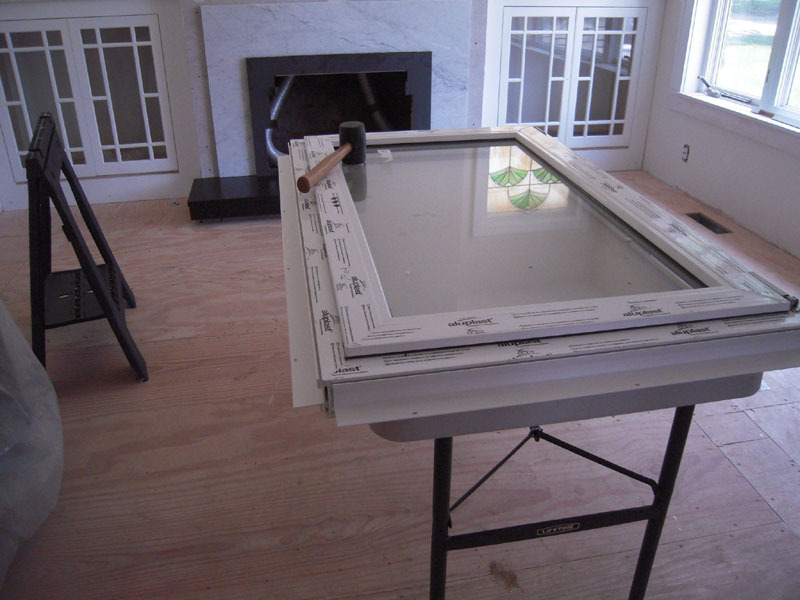 The frame is attached to the pressure treated window buck using Cortex Screws. 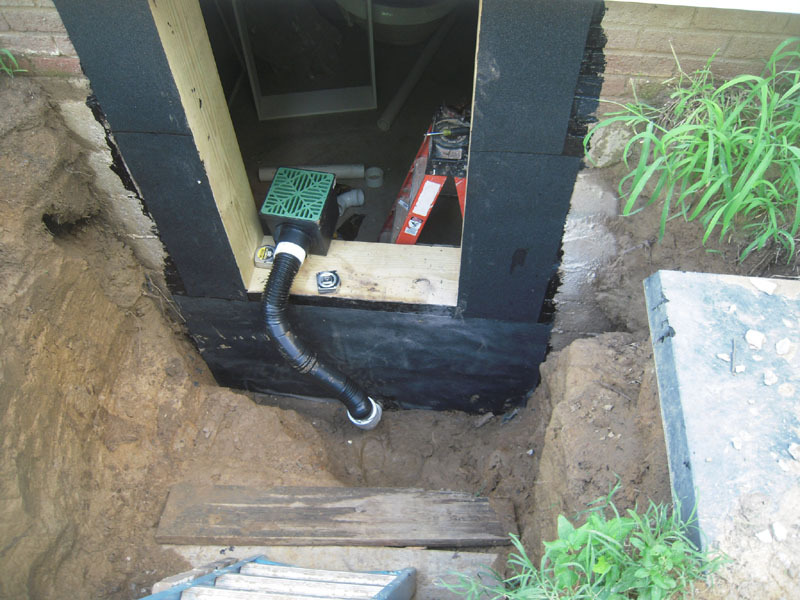 This frame fits up underneath the water table trim and the bottom extends down below the drain surface. 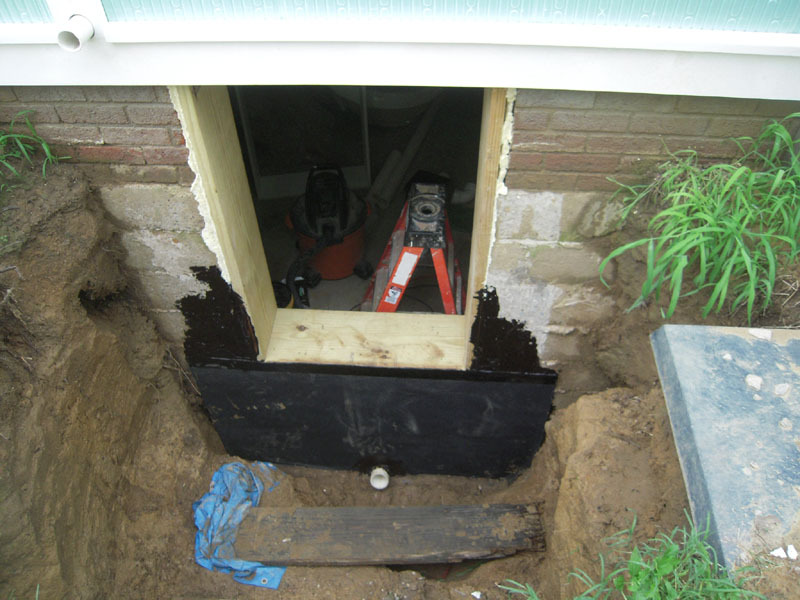 The wide sides cover the foundation allowing the side panels for the window well to attach through the frame into the foundation. Confusing? It will be clearer in the next post. If you’ve followed along with this blog over the years you might notice that I don’t complain very much – after all, this is my hobby. 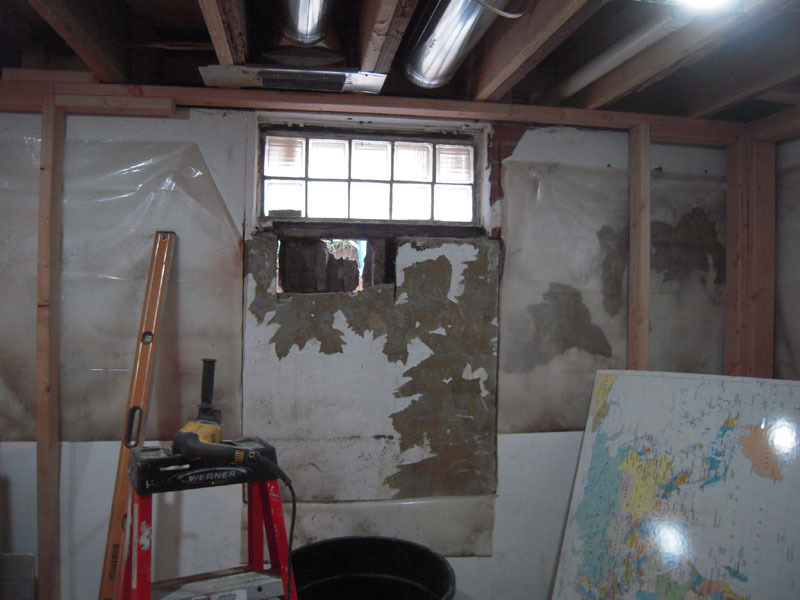 I love renovations – the work itself is therapeutic to me. But it’s the designing and figuring this stuff out in my head that is my most favorite. I love the mental challenge of each project. 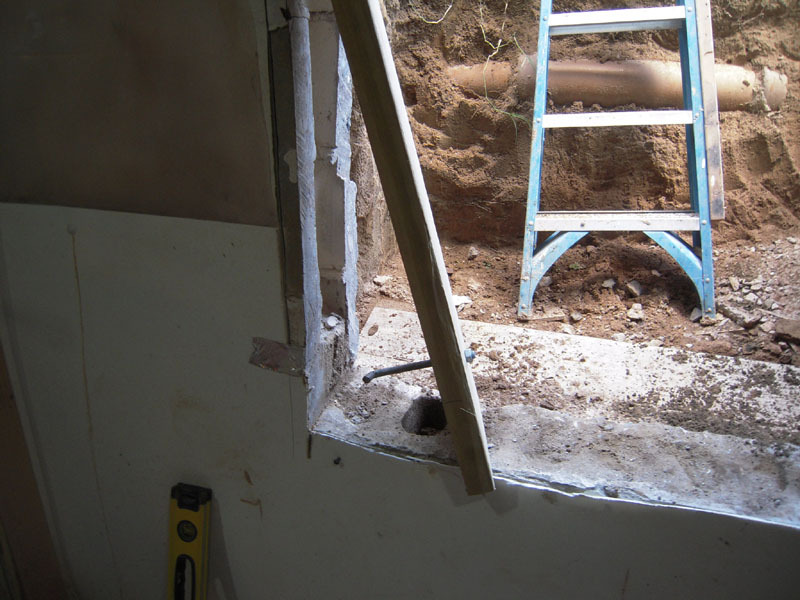 This egress window has tested me physically as well as adding a little mental confusion along the way – and a couple of calamities thrown in for good measure. Oh, and one other thing – this project is like everything else – overkill. I’ll do more than what’s normally required to complete a project like this – but it’s a hobby. Here’s a selfie of the results of cutting the foundation. It looks like I have multiple chins, but it is in fact brick and concrete dust caked to my skin. I had to hose off outside before my wife would let me come inside. Back to the window. 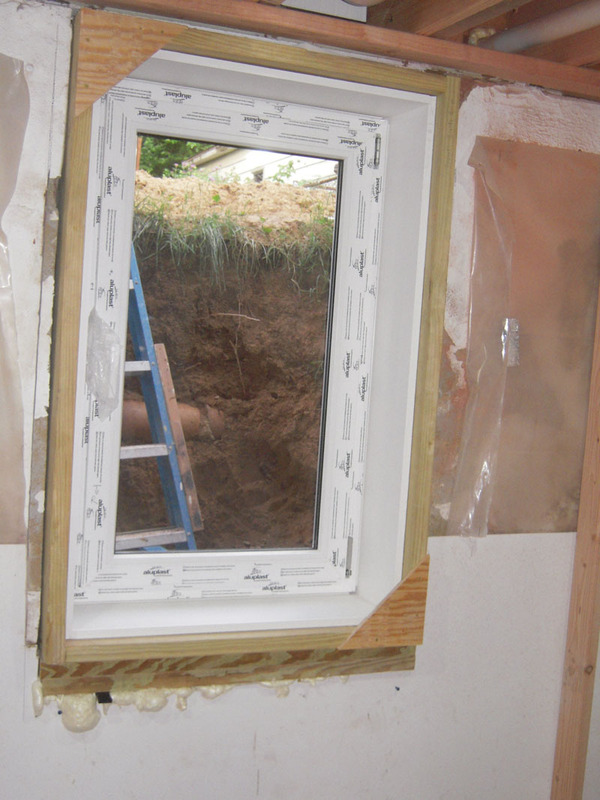 The sub-sill is added to the bottom of the window cut. 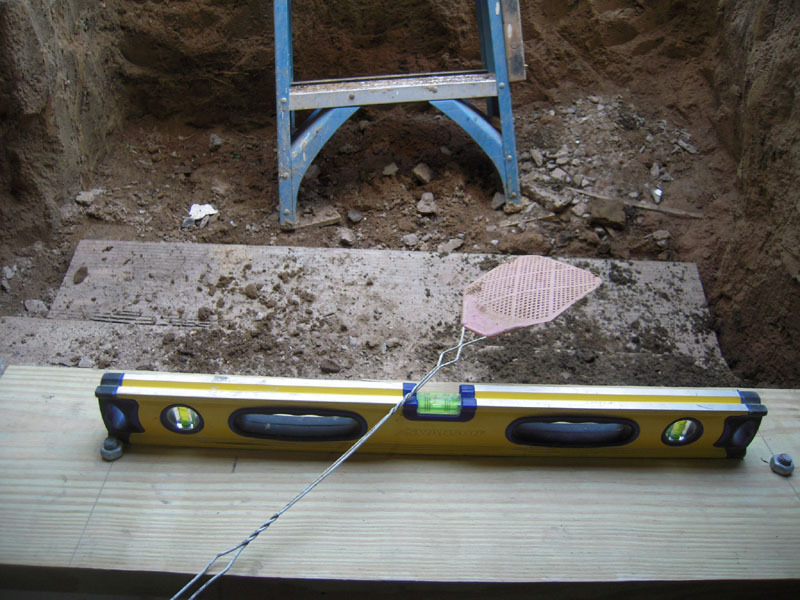 The piece is marked in two spots to reference the hollow core of the concrete block below. Holes are drilled in the sub-sill and anchor bolts are attached. 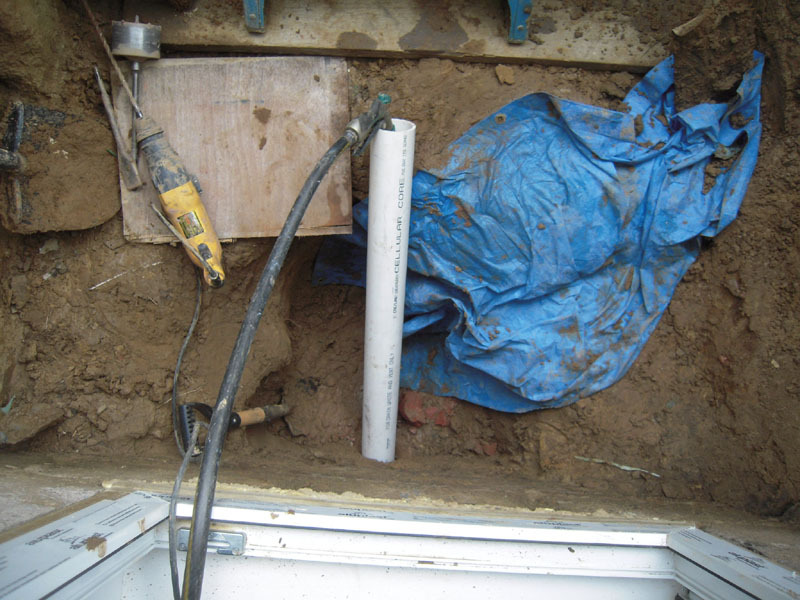 Anchoring cement is used to fill the cement block voids were the anchor bolts are located. The sill is leveled. The anchor cement sets in 20 minutes. 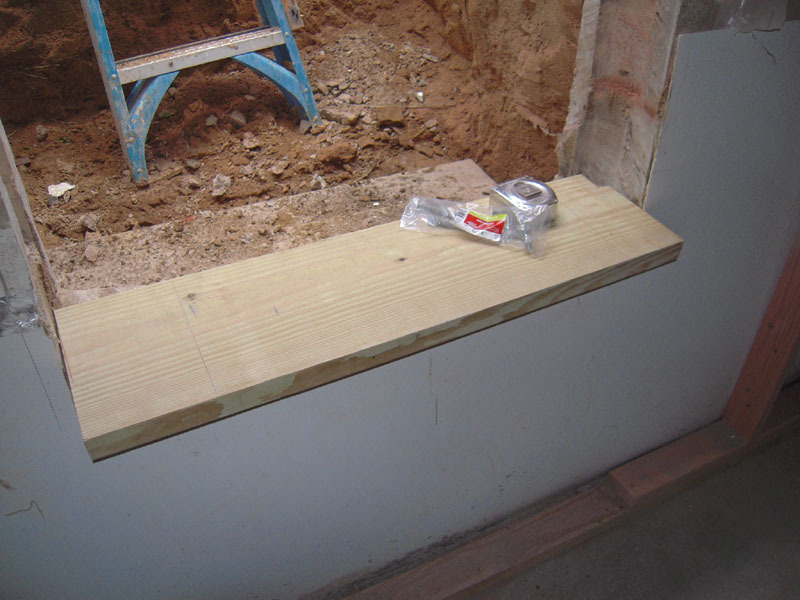 The sub-sill can then be removed to add adhesive for final installation. Oh, I forgot this part. Here is a picture of the ‘Waspenator”. 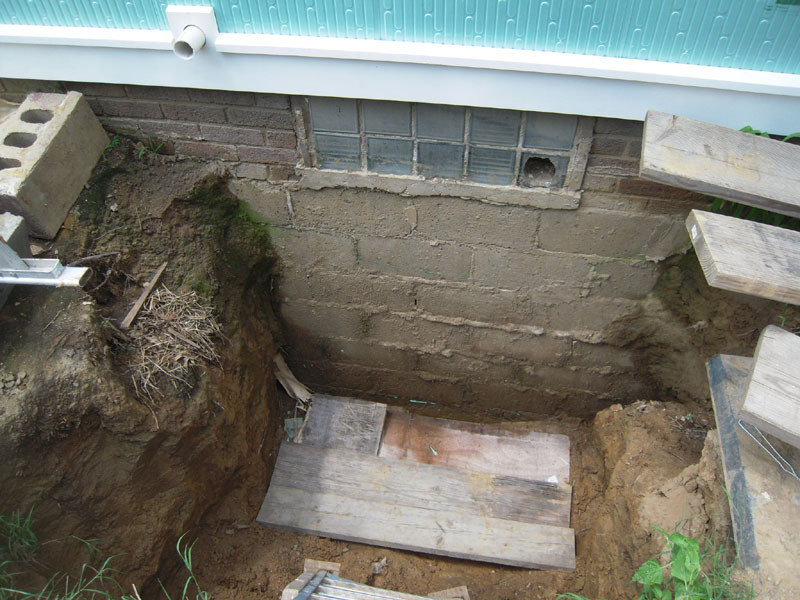 This hole was dug for several weeks before I could get to this point. In the mean time wasps had found this to be a really great place to hang out. With my first ladder step down into the hole I was greeted by lots of unhappy wasps. Some of you might remember that it was two years ago this week that a wasp instigated my ladder fall that put me in a wheelchair for six months. I’ve figured out that if you just move normally and not over react you’ll be fine. But I never forgot what they did to me. So the first day “Waspenator” and I dispatched 77 critters to Wasp heaven and the second day added 28. I quit counting after that. I keep my swatter handy and pick off one or two a day. But it seems I don’t have many left to swat. Revenge is so sweet. 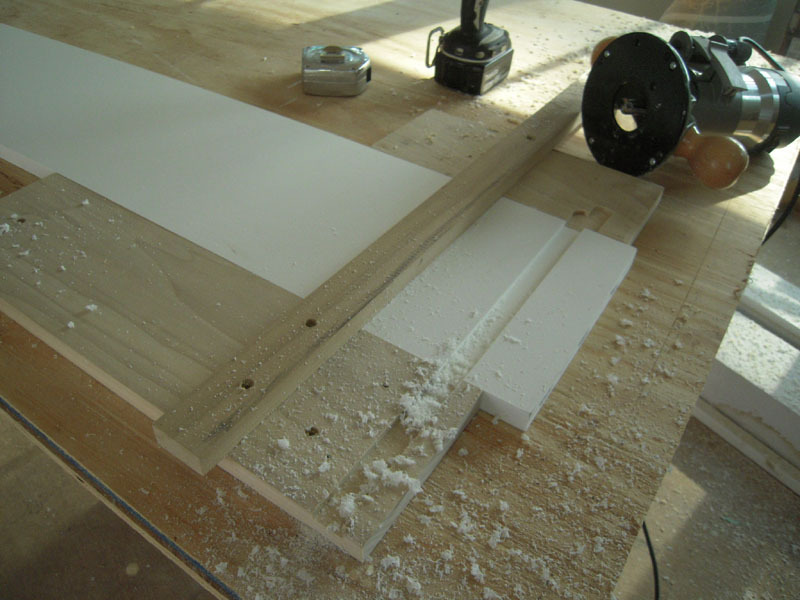 A second sub-sill was made from kiln dried treated lumber (see how pretty this stuff is). Holes were partially drilled to clear the bolts of the first sub-sill. That was temporarily placed along with the window buck assembly and the window to make sure they fit. Now the crappy part. 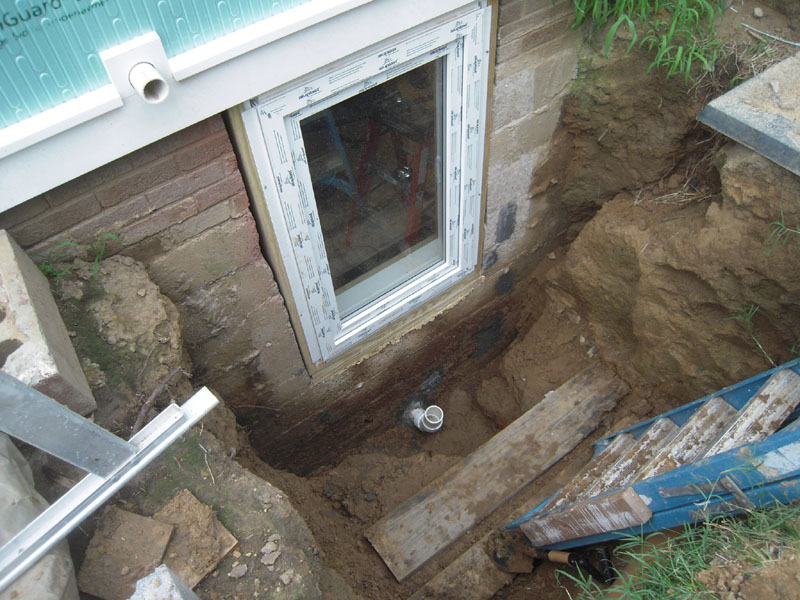 The window well needs to drain in case of a large rain storm. As usual it’s gotta be the best I can do. 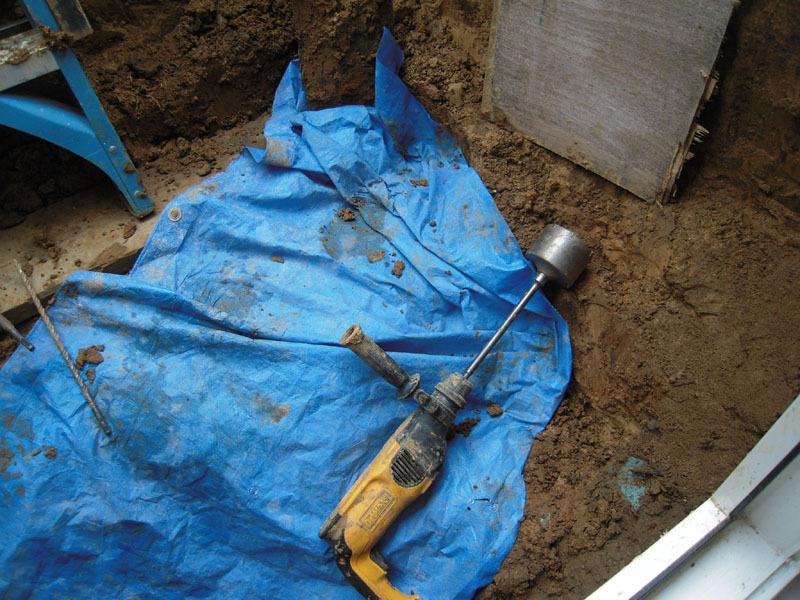 Here is a 3 1/2″ coring bit attached to my hammer drill – it’s just the right size for a 3″ PVC pipe. 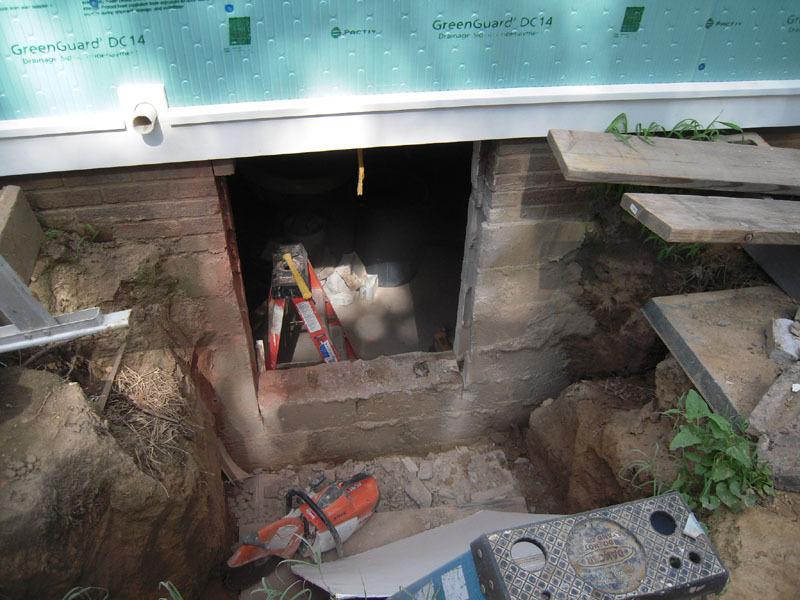 The hole needs to go through the foundation at the basement footer into the interior drain system that was installed earlier. This required me to dig a pit another three feet down. I had to drill this upside down with my head in the hole. It took several hours. No fun here. But after a few muddy noisy hours we have made it to the promised land. I’m checking the drain and it works fine. 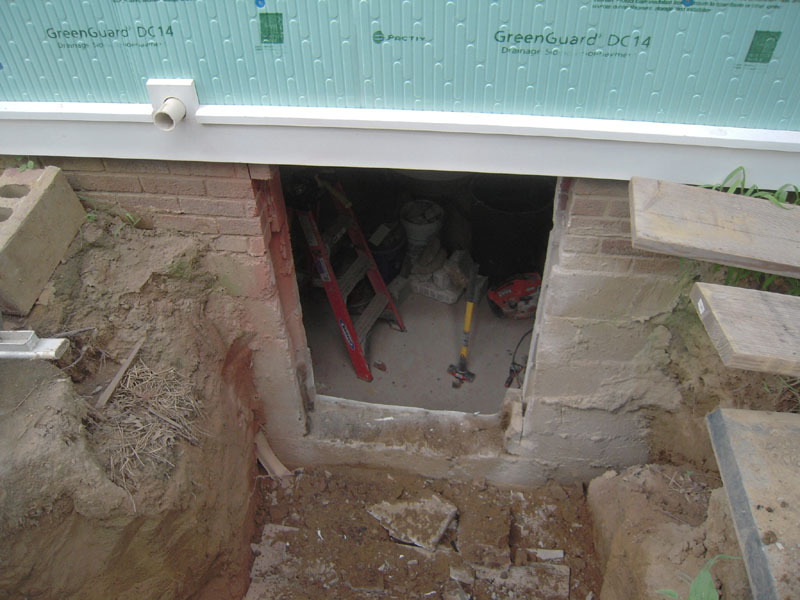 Once the pipe is placed hydraulic cement was used to seal the pipe to the foundation. 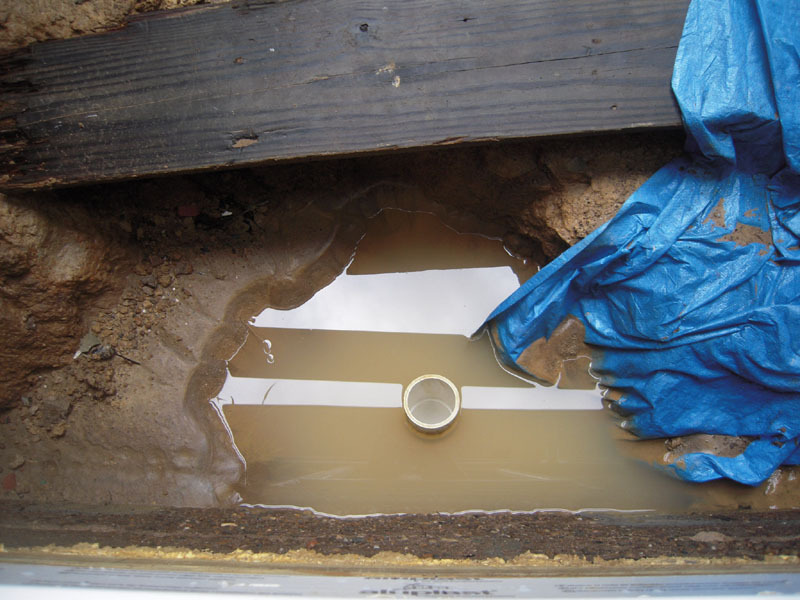 The drain is 9′ from the surface. Of course it rained every day due to remnants of Hurricane Bill. I spent a couple of hours each day last week pumping out water and digging out mud. Fun, fun, fun! But the drain worked. 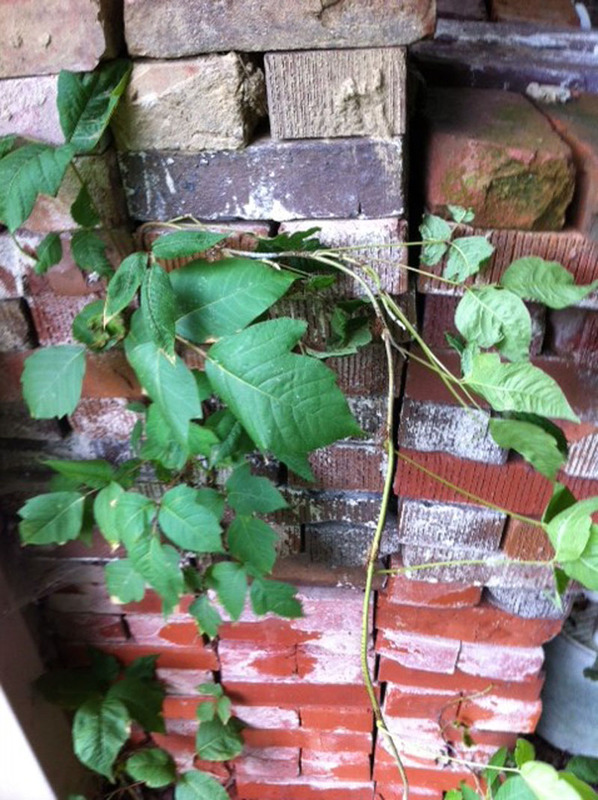 Oh, one more thing – in the middle of all this I got a great case of Poison Ivy when I decided to clean up some bushes in our back yard. The one (and only) day I decided to wear shorts, I might add. I called my Doctor who put in a prescription – when I went to pick it up the bill was 235.00. What? So I politely declined and went home and ordered this stuff Mean Green Hand Scrub and I will tell you it really worked magic for me. The 64 oz tub was a little over 30.00. Take that big Pharma . 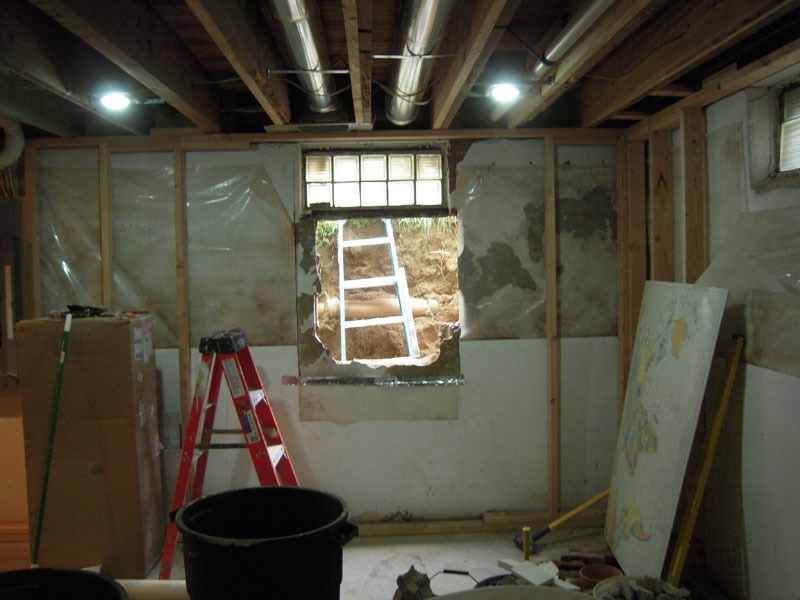 OK, this is one of a few posts about adding an egress window in an old house – didn’t I just say that in the heading? I wanted to warn you that if this is not something you have considered, then these posts might seem pretty long and tedious. But for those who need or want one – you might find this handy. 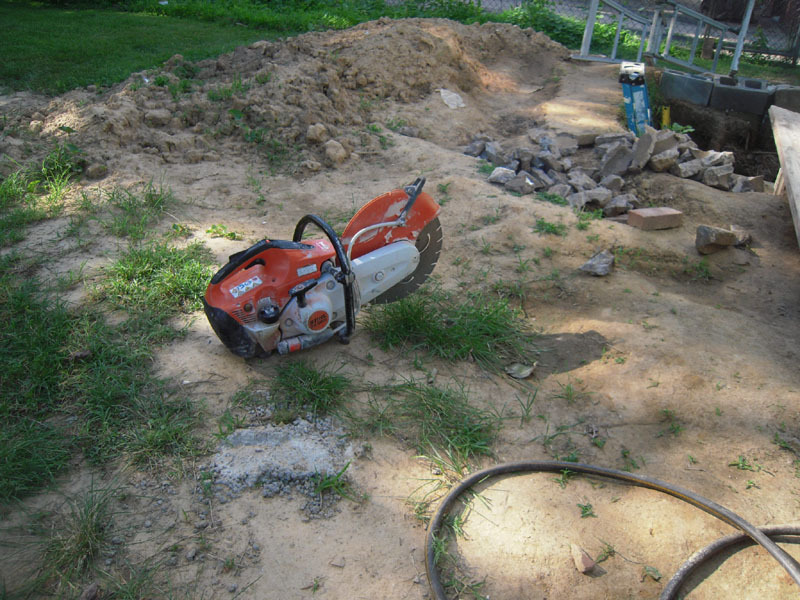 We covered digging in a previous post – but we’ll have to dig a little more before we’re done. And I might say – I’m not done, as this is a work in progress. 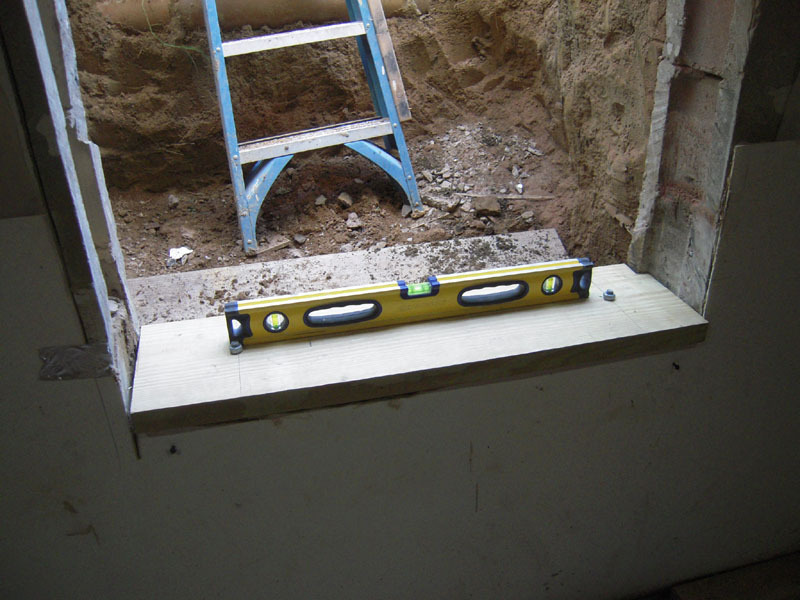 Here is where the egress window is going to go. 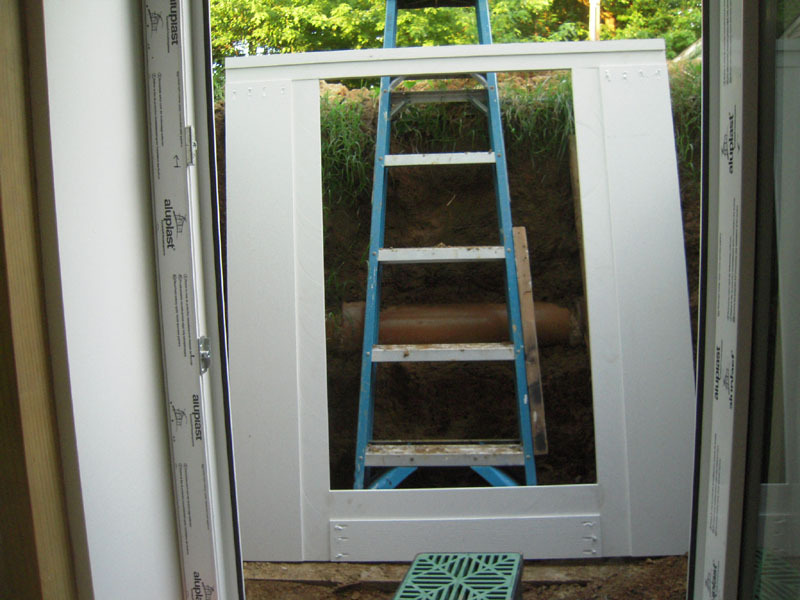 Go here to check out the requirements for an egress window – this is a big job and you don’t want to goof up the size and placement on these puppies. First was finding the right kind of window. You can use a variety of window styles – as long as you meet the requirements in the link above. Oh, and it’s a good idea to check with your local codes to make sure there’s not something additional needed. Casement windows are a good choice because of the single opening allowing a smaller overall size. But after lots of research I chose an Aluplast tilt and turn window. It opens inward like a door or can be vented at the top. Shown here, I’ve added the nailing fins that snap on the frame with a little help from a rubber mallet. First I made a frame of 1 X 10 AZEK that fits up against the interior of the window frame and nailing fin. 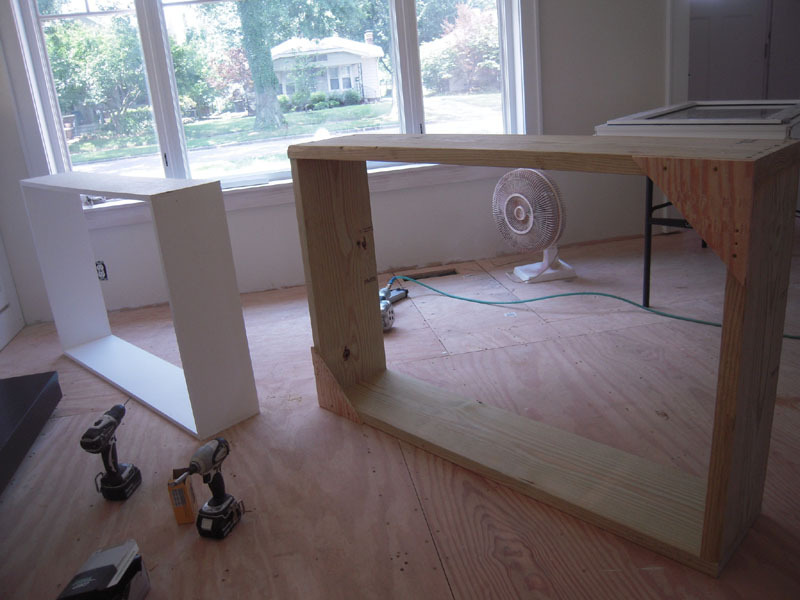 I routed the frame sides to receive the top and bottom pieces. I like to do this to keep the frame square front to back. I used PVC glue to assemble along with some stainless steel nails to hold in place. Once that has set overnight I cut the tails off of the frame so they were flush. 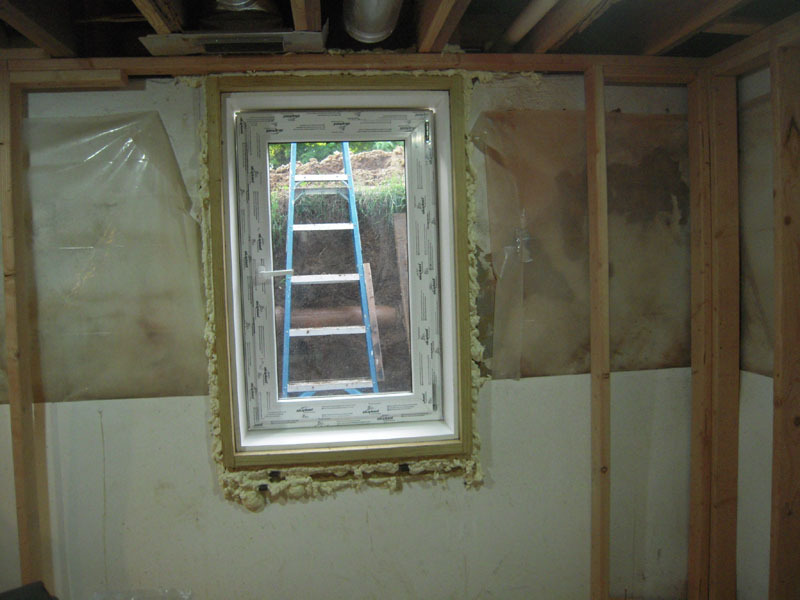 Next the window buck (frame that goes against the concrete) was made from 2X12 kiln dried pressure treated lumber. Please use kiln dried treated lumber – the stuff at the big box stores is not kiln dried and is nearly impossible to get straight. This stuff is almost like finish milled lumber. The buck is slightly larger than the AZEK frame. So you have the AZEK frame and the window buck. I added the triangle pieces on the buck to keep is square while the pl adhesive sets. 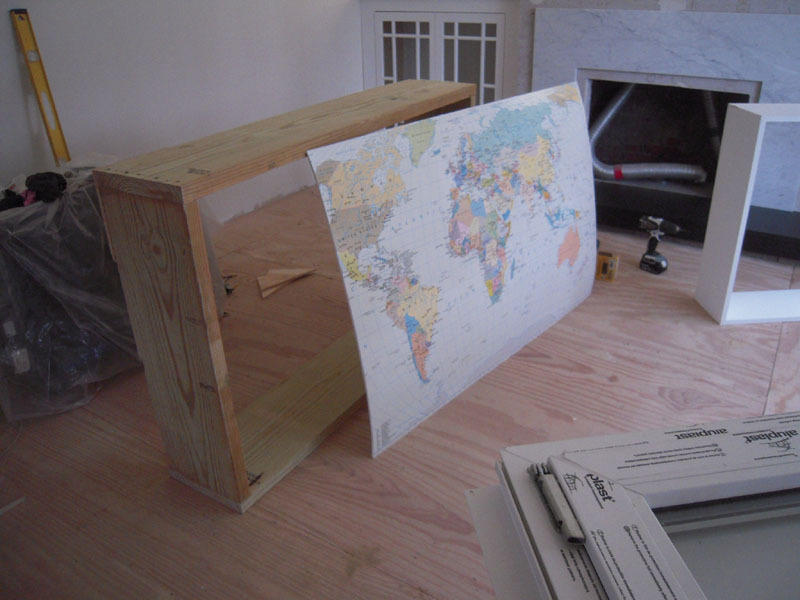 I used an old mounted map to make a template of the outside of the window buck. It’s a lot easier to handle to make the marks on the basement wall. I use a template anytime I’m not sure of the exact location – that window buck is heavy. Downstairs the template is used to mark the hole location. 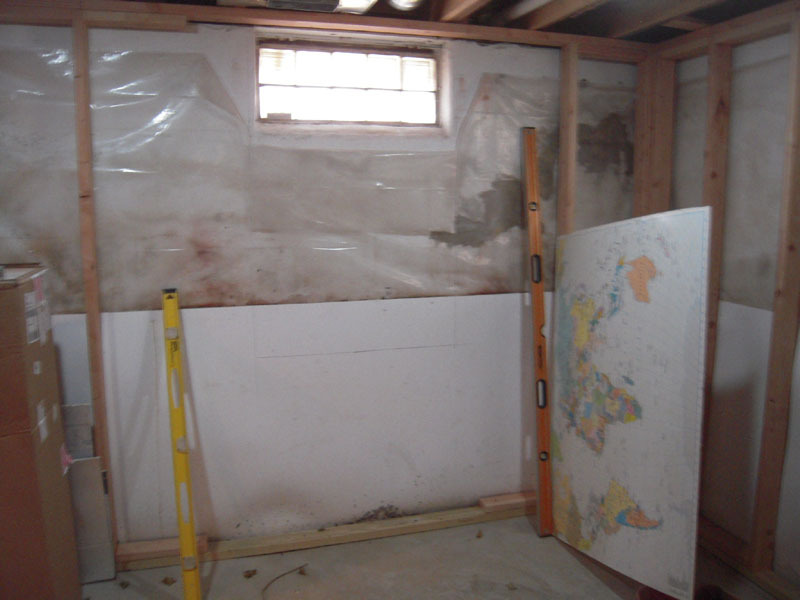 The good thing about old houses – the cheap ones that is – is they typically have concrete block walls. I would not attempt this if my walls were poured concrete. 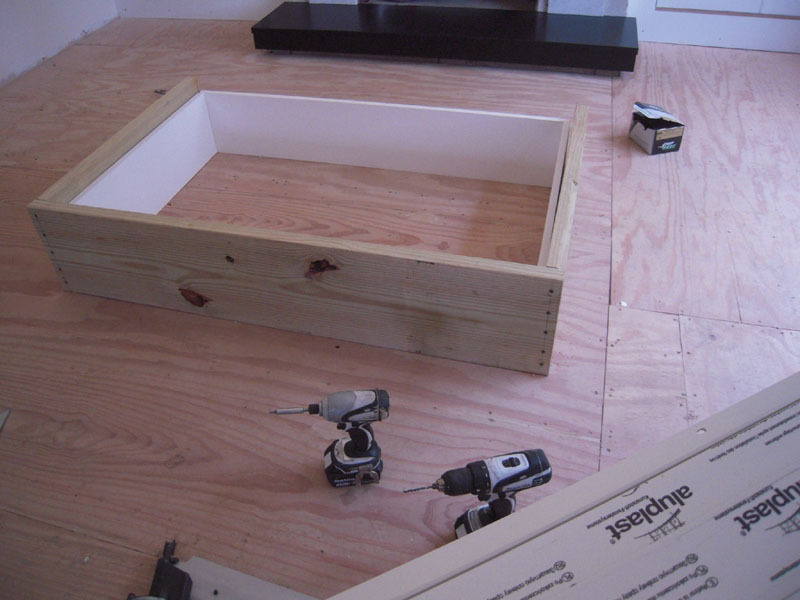 But if you have block walls it’s a pretty easy project – sort of. First find a full block that you can chip out the mortar at the top. A hand sledge will take care of it with little effort. Once you have the first one out use a hand sledge to break the web of the block next to it. Once the web is gone the front and back of the block will break away easily. Do this until you have all the blocks removed that don’t need to be cut. 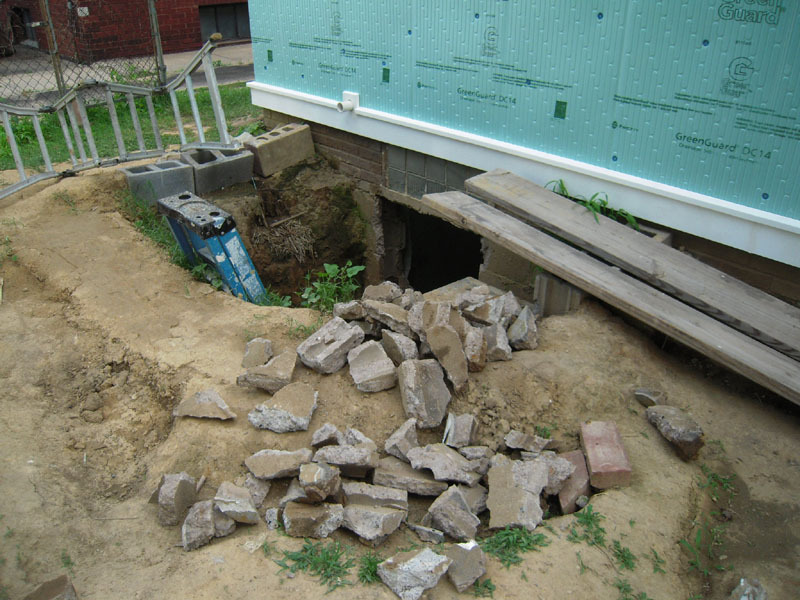 Of course, you’ll have a pile of broken concrete blocks – but they’re a lot easier to throw out of the hole when in pieces. 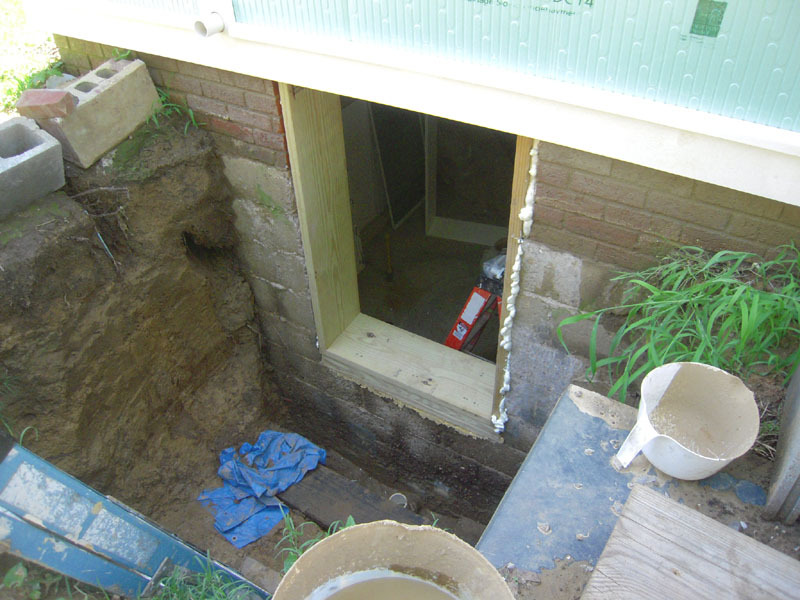 Here is the finished hole after breaking out all of the blocks. Time to get down and dirty. 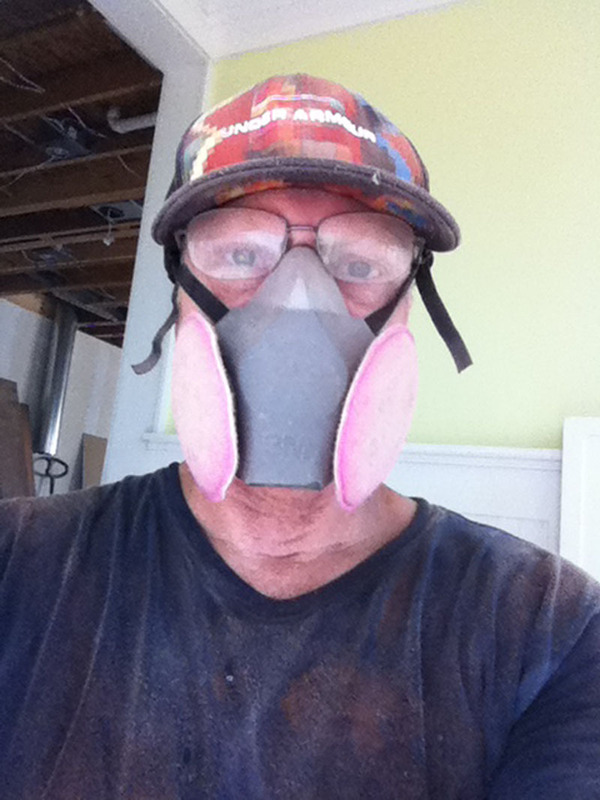 Please wear a respirator when you crank up the concrete saw. This one’s 14″ with a diamond blade. The saw is used to cut the edges flush so that the window buck will slide into place. 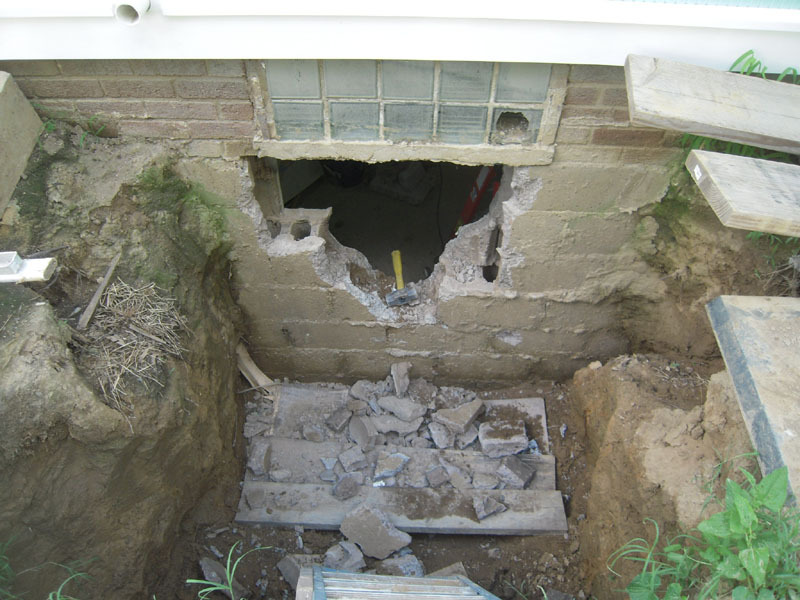 Since the depth of the window landed midway between a block course – I decided to take it down to the next block and build up from there. So that’s it – nothing pretty. It has been pretty simple up to this point – we’ll see how it goes from here.